Describe how a partner may be liable to creditors of the partnership based on the acts of other partners. Explain how that liability could be established despite the lack of any real or actual authority in the particular partner dealing with the outsider. Further, suggest any means by which a partner could try to limit any such potential liability you have discussed above. Marlin Fishing Pty Ltd carries on the business of commercial law fishing. The company is run by4 directors; Michael and his three (3) sons Dan,Terence and Pat. They are also the only shareholders and hold equal interests. The company has a constitutionthat requires that all contracts to be entered into on behalf of the company must in the firstinstance be approved by a meeting of the directors and that the company seal should beaffixed. The constitution expressed that when the company seal was affixed it needed to beaccompanied by the signatures of two (2) directors. Michael discovers a new boat for sale which would considerably improve the ability of the fishermen to stay at sea longer and better keep the catch of fish. He decides to purchase the boat on behalf of the company believing that his sons would agree with the decision. He dealt with a friend of his who ran Commercial Vessels Pty Ltd. His friend knew what Michael did and assumed he ran the family commercial fishing business, so he was very happy to deal with him. 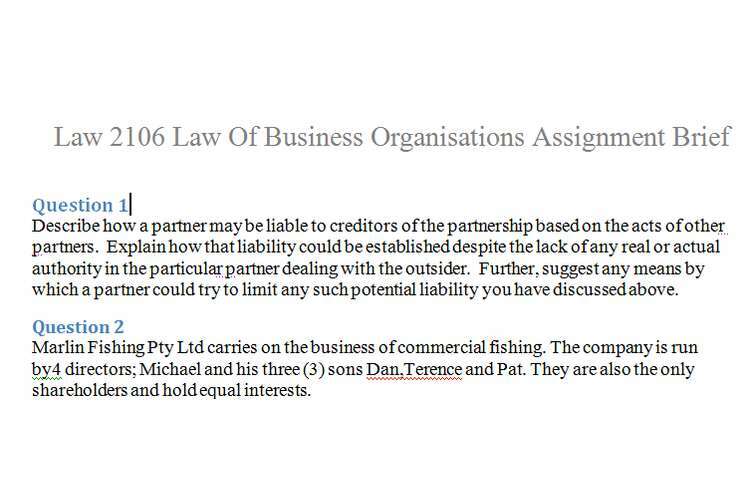 Michael simply signed the contract: ‘Michael, for and on behalf of, Marlin Fishing Pty Ltd’. When Dan, Terence and Pat learned of the purchase of the new boat they refuse to ratify the contract and do not wish to spend the company funds on such a vessel at this time. Advise the sons whether the company will be bound by the contract and also identify any possible consequences for Michael.